He was born in Armenian Jewish family in Kashan, Persia. His date of birth is unknown; scholars say it at 1590 CE, however some claim for a range of dates between 1590 till 1618 CE.He resided in Iranian town of Kashan, hence getting the surname Kashani. Sarmad, I think is his Sufi name, I do not have any information about his Jewish name. He also had a Muslim name Muhammad Sa’id. 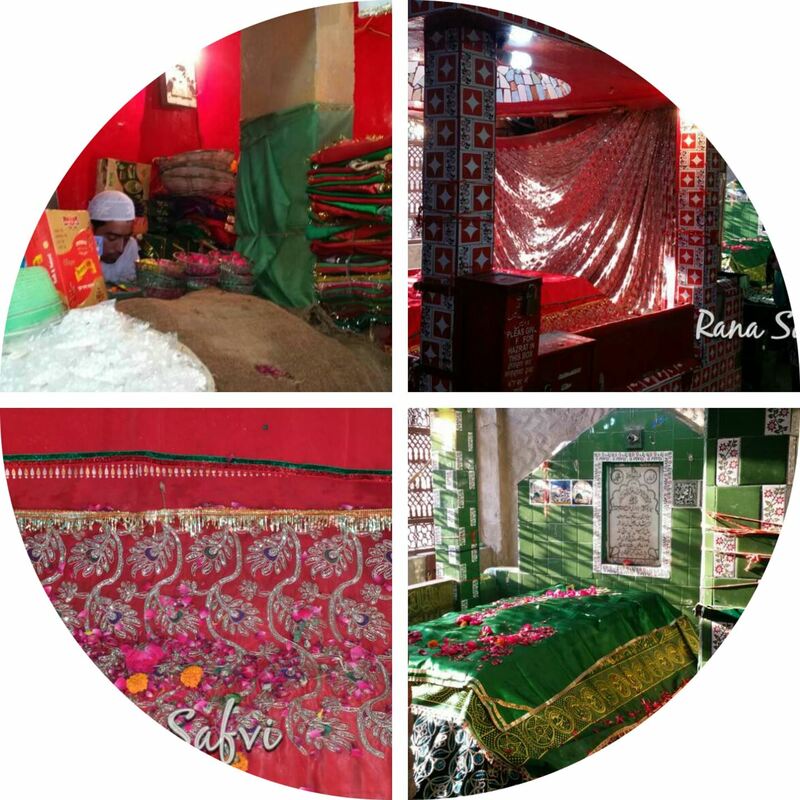 Since Sarmad R.A was martyred his dargah and grave are a very bright red in colour. 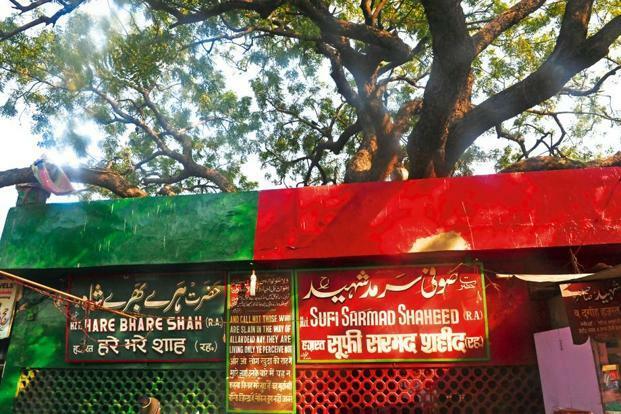 There may be others but I have not seen any other dargah in red. 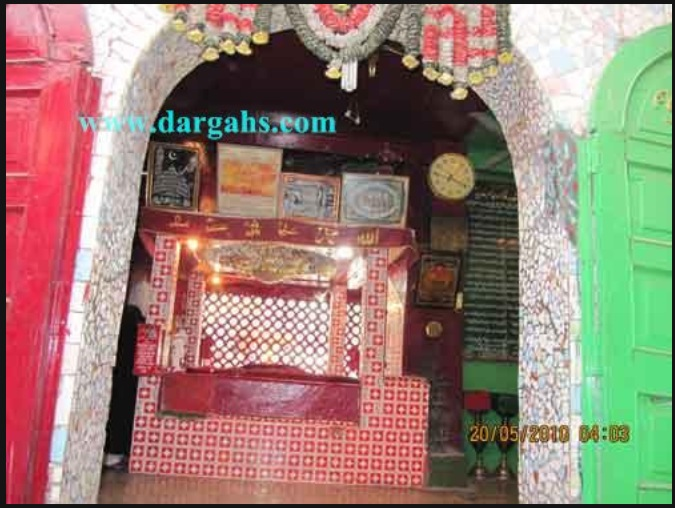 Sarmad R.A and someone who is said to be his Sufi Master, Syed Abul Qasim Hare Bhare Shah R.A share the dargah itself.Hare Bhare Shah R.A was a saint of the Qadriya silsila as per the shajara or genealogical chart hanging nearby. Dara Shikoh, a Sufi of the Qadriya silsila (order) called Sarmad his master and preceptor and frequently held discussions with him on his ideas of religion. Once Dara Shikoh was killed By Aurangzeb and the latter ascended the throne it was a question of time and finding a proper pretext to order the execution of Sarmad. The Qazi and ulamá were set about to find the frame the charges which would lead to his execution. Sarmad himself did nothing to shield himself or hide his disapproval for the king. One very famous incident describes Aurangzeb who seeing Sarmad sitting naked on the steps of Jama Masjid asked him to cover himself with a blanket lying near him. Sarmad asked to pass the blanket to him. “The king then tried to lift the blanket by holding its end and to his utter amazement noticed a dreadful scene underneath the blanket—the severed heads of all his brothers and other relations were lying there and fresh blood was flowing from them” [Rai 1978, p. 46]. This is often narrated to children ( related to me by Gulnaz Sheikh who heard it from her father as a kid) as one of those stories with a moral : That one should not judge a man by his clothing and we must also cover up other people’s sins. He is in my bosom; search for Him in me! Tis strange that a thief has caused me to be naked! However Aurangzeb and the Qazi knew this would not hold in the eyes of the public so charges were framed which would accuse him of blasphemy. Sarmad says that the heavens were inside Ahmad! The second was of course the main reason for all the other accusations: that he was a sympathizer and well wisher of Dara Shikoh. He was summoned to the court where these charges were read out against him in front of the Emperor, scholars and religious leaders. When Aurangzeb taunted him with his prediction that Dara Shikoh would attain the crown, Sarmad replied that he had attained the crown of the eternal kingdom. The religious scholars were consulted since being naked in itself was not a reason for death and he was asked to recite the kalima. Sarmad responded with ‘La Ilah’ There is no God. The scholars decided that this action of his was blasphemy [kufr] and that repentance was necessary. Sarmad refused to repent and it was felt that death penalty was permissible in this case. “May I be sacrificed for you! would have been too severe. According to legend, his decapitated head started reciting the full kalima (La ilaha illa’llah- there is no God, but Allah)showing that in death he had achieved his affirmation of faith. Sarmad’s Rubaiyyaat e Sarmad (Quatrains of Sarmad) in Persian are a font of knowledge, mysticism and delight. They ere translated by many but one of the most famous translations have been done by Maulana Abul Kalam Azad who compared himself to Sarmad for his freedom of thought and expression. It is said that that the troubles which plagued Aurangzeb throughout his reign and downfall of the Mughal Empire were due to this unfortunate decision to behead Shah Sarmad. Due to my burning have I been made a confidante!